A migrant man walks on railway tracks with a towel on his head at the northern Greek border point of Idomeni, Greece, March 18, 2016. Rights groups are discussing a legal challenge to a potential deal between the European Union and Turkey for the transfer of tens of thousands of migrants from the EU to Turkey. After tense negotiations, EU and Turkish leaders appeared close to agreeing on a deal Friday that’s meant to curb the refugee flow. However, amid accusations that the EU is compromising core values and claims Turkey that has blackmailed Europe, the agreement may not be workable and risks being derailed by legal and bureaucratic challenges. 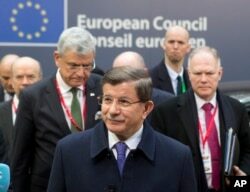 Turkish Prime Minister Ahmet Davutoglu, center, arrives for an EU summit in Brussels on Friday, March 18, 2016. The EU has been attempting to tackle a refugee crisis that saw more than 1.2 million refugees and migrants arrive in Europe last year and is roiling European politics, risking to end for good the bloc’s hallowed visa-free internal travel system. “This new proposal is only the latest in a dangerous trend,” Human Rights Watch declared Friday. “Over the past few months, European governments have imposed discriminatory border closures and unlawful caps on asylum applications. No one should be under any illusion ... the very principle of international protection for those fleeing war and persecution is at stake,” the rights group said in a statement. FILE - Refugees and migrants, who entered Macedonia from Greece illegally, walk between the two lines of the protective fence along the border line, near southern Macedonia's town of Gevgelija, Monday, Feb. 29, 2016. An overall challenge in the courts isn’t the only legal uncertainty facing a deal that will see Turkey get billions of dollars in EU aid for Syrian refugees in the coming years in addition to the $3.3 billion the bloc has already committed to help Ankara cope with its refugee crisis. 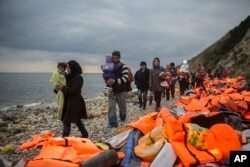 Greece must alter its asylum laws to consider Turkey a “safe third country” to receive asylum-seekers, otherwise it will be in violation of its own laws when deporting back to Turkey refugees arriving on smuggler boats on its islands in the Aegean. 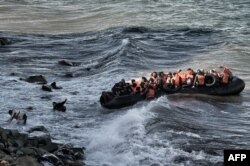 Refugees and migrants try to reach the shore on the Greek island of Lesbos, despite a rough sea, after crossing the Aegean Sea from Turkey, Oct. 30, 2015.. Likewise, Turkey also will have to overhaul its laws to become compliant with the 1951 Geneva convention on refugees, which it only partially applies, including providing greater protection of refugees and speedier processing of asylum claims. There are at least 140,000 unprocessed refugee asylum applications pending in Turkey and some European officials think the true number is much higher. If Ankara and Athens fail to reform their refugee laws and improve their treatment and processing of asylum-seekers, then rights groups will likely pounce quickly with court challenges. A boy reads an announcement distributed by Greek police officers informing refugees and migrants that the borders to Macedonia are closed and they should consider moving to relocation centers, at a makeshift camp at the Greek-Macedonian border near the village of Idomeni, Greece, March 18, 2016. Legal problems aside, logistical challenges both for the EU and Greece could quickly imperil the deal — much as with less ambitious efforts in the past two years to stop the refugee flow, admit EU officials. For the plan to work, the EU and Greece will have to quickly develop an asylum-processing and containment infrastructure on the Aegean islands. Up to 200 judges and civil servants, as well as an army of translators, will have to be dispatched to Greece to process thousands of arriving refugees to hear their arguments about why they should not be returned to Turkey. An appeals process will have to be observed to avoid falling foul of EU rights laws. FILE - Refugees and migrants walk along a beach after crossing a part of the Aegean on a dinghy, from Turkey to the Greek island of Lesbos, Dec. 12, 2015. The same, too, in Turkey to implement the process of accepting refugees who play by the new EU rules and apply there for settlement in Europe. Challenges in Turkey will include where hot spots are set up — most of the 2.7 million Syrian refugees in the country are not in camps and they are spread along the border with Syria with many in Istanbul. On top of that, refugee lists are highly inaccurate. “Even discounting the high numbers of refugees who are not even registered in the Turkish system, the lists we are getting from the Turks are full of sloppy misspellings,” says a relief official who has been assisting the U.N. refugee agency. “When we check them out we find the Turks have failed to list all the members of a family, for example,” she adds. The relief worker asked not to be named in this article as she is not authorized to speak with the media. “We are really not set up to be an implementing organization,” an EU diplomat based in Turkey told VOA. “Brussels decides on policy without fully appreciating that we don’t have the manpower or resources and it takes time to build up capacity,” he added. The diplomat points to the six-month time lag before the EU could get so-called registration “hot spots” set up in Greece. The EU first decided in September to establish four registration and sorting centers to process arrivals on the Greek islands but they only started to operate last month. Now these hot spots will not only have to register arrivals but will have to organize the detention of newcomers’ while their claims are being considered, meaning new secure prison-like facilities will have to be built and security staff employed. And a transport system for those to be returned to Turkey will have to be set up. The chances of frustrated and desperate newcomers who have spent their life savings on trying to reach Europe turning violent are high. 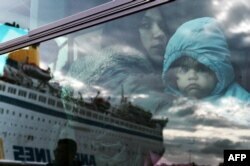 Forcing asylum-seekers — many of them likely children and women — onto ferries or buses for their return journeys to Turkey has all the the makings for a public relations disaster for the EU. A lot of the logistics will fall on the cash-strapped and disorganized Greek state, and even with extra EU funding to help, Athens will struggle. “You don’t need to tell me that this is going to be very complicated in legal and logistical terms,” Frans Timmermans, the European Commission vice president, acknowledged this week. FILE - A woman and a child peer from a bus, after migrants and refugees disembarked from a government chartered ferry, seen in reflection, in the port of Piraeus in Athens on Nov. 27, 2015. For the Greeks, the logistical nightmare begins with how to transport to mainland Greece the 8,000 refugees and migrants already on the islands before a return-to-Turkey-policy starts. Refugee camps are already straining at the seams and more capacity needs to be developed, not only for the 8,000 who will have to be moved from the islands but the 11,000 or so still on the Greek-Macedonian border at Idomeni. A migrant holds her child as she queues for food portions at the Greek border camp near Idomeni, March 10, 2016. By returning thousands of asylum-seekers, the EU hopes to deter others from trying to smuggle themselves into Europe, convincing them that their best chance to secure re-settlement in the EU will be through applying in Turkey. But fearing an open-ended commitment, EU officials say they are unlikely to accept more than 72,000, a figure close to a total they mentioned last year but have failed so far to settle. And it isn’t clear what criteria the EU will use to decide on which Syrians to accept. With such a low ceiling and a lack of transparency about the basis on which the lucky 72,000 will be chosen, many Syrian refugees eager to leave the Mideast are still likely to chance an illegal attempt to make it to Europe. And Iraqis and Afghans, who are not part of the deal, have no incentive, to play by the new rules at all.